Attractive colors and durable quality, these are the attributes that have made our range of decorative fringes popular in home furnishing accessories in the industry. 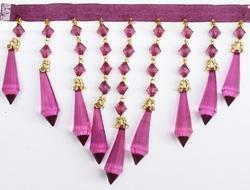 Fringes we design and manufacture is made of rayon, polyester, glass beads etc. 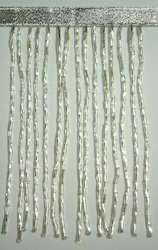 From bead fringes, bullion, rayon to tassel fringes, our collection is available in varied sizes and colors. These decorative fringes are widely used in decorating different items like cushion cover, place mats, table mats, napkins, curtains, throws, ladies garments, pillows, handbags, purses, pouches, children wear, etc. *8.5cms long [140 lari 1met.] & 0.5" Ribbon tape. 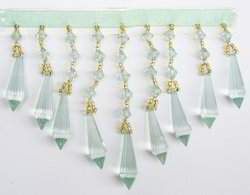 *Beautiful Beaded Fringes for attachment / embellishment on Garments or Home Furnishings-Curtains or cushions. *To decorate curtain, cushion, tablecloth, lampshade etc. 1)Size 0.75" Lace & 6cms. Lari. Size 1cms. Lace, Big Strands 10.5cms. & small Strands 5.5cms. *Size 1cms. Lace, Big Strands 10.5cms. & Strands 5.5cms. *We can offer different colors according your demends. *Size Lace 0.5" & Lari 3". 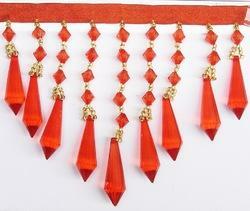 5)We make all kind of beaded products tassels, tieback, lace , fringe ect..
6)Welcome to customer's design & colour. *Size 1cms. Lace & Lari 3cms. 1)Size 2cms. Lace & 5.5cms. 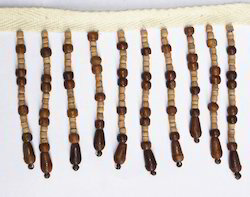 Bead Lari. 1)Size: 2cms. Lace, & 5.5cms. 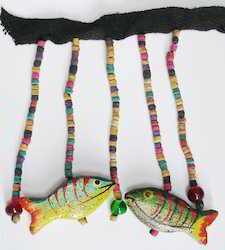 Bead Lari. 5)Size could be done as customer's request. 6)Beaded Fringe mainly used to decorate sofas, window curtains, cushions borders, craft projects, 7)costumes and wedding ring pillows. 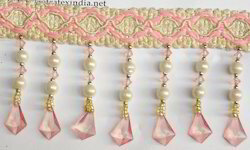 7)Use for garment, home furnishing, curtain etc..
*Size 0.5" Lace & Lari 3"
*Size 0.75" Lace & 6cms. Lari. *Size 0.75" Lace & Lari 2". 1)Size 1cms. Lace & 8cms. Lari. 7)Variant color, size and design. 9)Different colors and styles are available. 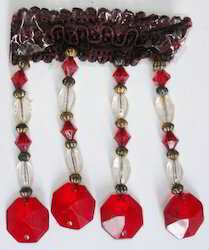 1)Size 0.5" Lace & 0.75" Big Lari. 5)Any size we can make. *Size 1cms. Lace, Big strands 10.5cms. & small strands 5.5cms. *we make many products of Beads as Beaded Tassel, Beaded Tieback, Beaded Coasters, Beaded Napkin Ring etc..
*Use for garment, cushion cover, table mat etc..
*Size 1.25cms. Lace & 9.5cms. Bead Lari. 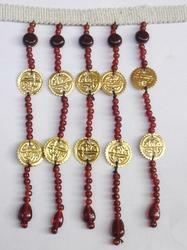 *We make all kind of beaded products tassel, tieback, laces, fringe etc..
*Garment accessories Beaded Fringe . *Size:1.5cms. Lace & Length 6cms. *Fringes for decorating Curtains, Cushion Covers, Garments & Many more Items. 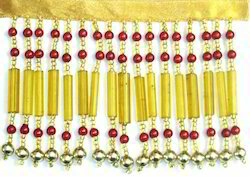 *We make many products as Beaded Tassel, Beaded Tieback, Beaded Curtain, Ribbon flower etc..
*Size Finge 0.75" & Tape 0.5". *Beautiful fringe for attachment on garment, house, cushion cover etc..
*Size 2cms. Lace & 5.5cms. Bead Lari. *To decorate curtain, cushion , table cloth , lampshade etc..
*Size: 2cms. Lace & 5.5cms. Bead Lari. 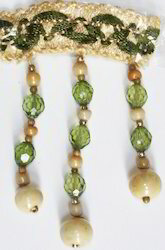 *The quality of the Beaded Fringe very perfect. *Size 1cms. Lace & 14cms. strands. 4)Size could be done as customer, request. 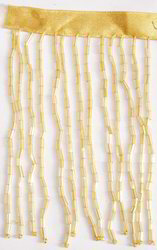 1)Size:1.75" Width & 1" Distance Between Strands. *Size:Fringe of 1.25" Tassel 2" Distance Between Strands 1.8". 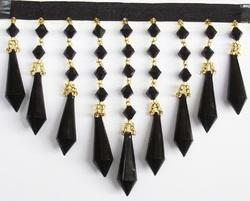 Looking for Beaded Fringe ?